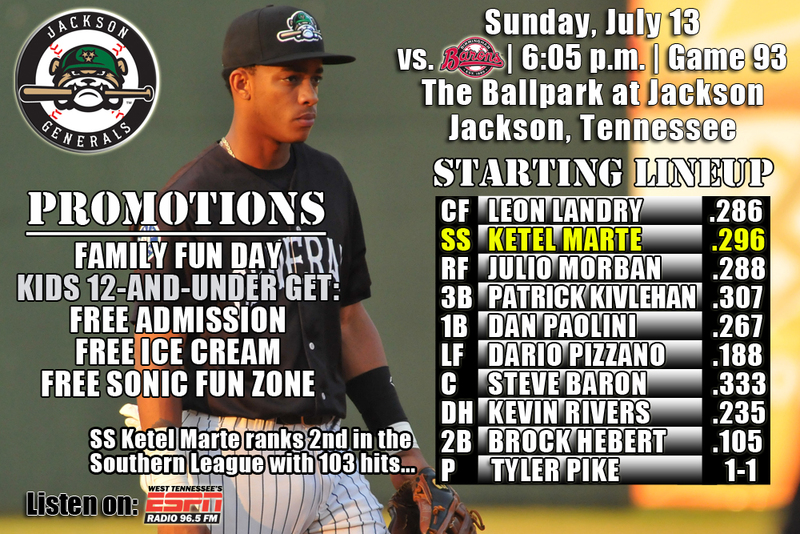 • The Generals continue a 5-game homestand tonight against the Birmingham Barons in Jackson with game 4 of the series (2-1)…are coming off a series win at Huntsville (3-2) and have won 5 of 7…also are 5-3 against Birmingham this season and will play the Barons 7 more times in Jackson the final 22 home games of the season. • DH Dario Pizzano hit 2 triples and drove in 3 runs and starter Victor Sanchez struck out 9 over 8.0 innings as Jackson defeated Birmingham 7-1 on Saturday night. • Pizzano (2×3, 2 R, 2 3B, 3 RBI) and RF Kevin Rivers (2×3, R, 2 2B, RBI, BB) combined to record 4 of the teams 9 hits with 3 runs scored, 4 extra-base hits and 4 RBI. • Starter Victor Sanchez (8.0,3,1,1,1,9,HR) allowed only 1 run on 3 hits, while striking out 9 in 8.0 innings to pick up his 5th win of the season. RH Richard Vargas (1.0,0,0,0,0,0) tossed a 1-2-3 9th inning close out the game. • The Generals have posted double-digit hit totals in 6 of last 7 games (only 9 last night) and batted .310 (75×242) over their last 7 games, winning 5 of those, scoring 42 runs on 75 hits with 11 doubles, 5 triples and 10 home runs. • Jackson now ranks 3rd in the league doubles (165), 2nd in triples (32), 4th in slugging (.387) and 3rd in batting (.263) on the season. • D.J. Peterson will miss his second straight game today because of playing in today’s Futures Game at 4:00 p.m.. He was named to the U.S. Team for the 2014 SiriusXM All-Star Futures Game. Peterson will bat sixth and play first base for the U.S. squad at Target Field in Minneapolis as part of the All-Star Week festivities. • Hot Hitting July – After batting .294 as a team in June, the Generals are currently batting .277 in July, which ranks 1st in the league. The 11 July home runs ranks 3rd in the league. INF Patrick Kivlehan currently has a 6-game hit streak, batting .409 (9×22) with 7 runs scored, 1 double, 1 triple, 1 home run, 4 RBI and 2 walks. • INF Dan Paolini has hit safely 9 of 10 games appeared in July, batting .389 (14×36) with 6 runs scored, 4 doubles, 2 home runs, 7 RBI and 2 walks. • OF Dario Pizzano has hit safely in each of his last 6 games, batting .400 (8×20) with 6 runs scored, 2 doules, 3 triples, 1 home run, 9 RBI and 4 walks. • OF Leon Landry has hit safely in 14 of his last 15 games, batting .324 (22×68) with 8 runs scored, 3 doubles, 1 triple, 4 RBI and 7 stolen bases. Since June 7, Landry has hit safely in 26 of his last 29 games with 15 multi-hit efforts, batting .356 (42×118) with 18 runs scored, 6 doubles, 3 triples, 7 RBI, 3 walks and 12 stolen bases. During this 29 game stretch he has raised his season average from .236 to .286. • Success against Birmingham at home – Since 2008, the Generals are 34-17 (.667) at home against the Barons. • 3B D.J. Peterson homered last Saturday, Sunday and Tuesday in Huntsville and has now hit safely in 14 of 15 games with Jackson, including 7 straight. Peterson is batting .290 (18×62) with 8 runs scored, 4 doubles, 3 home runs, 7 RBI and 4 walks.